Maximize your potential by improving your workflow and toolset. Get a first-hand look at how professional developers are building websites easily and efficiently. 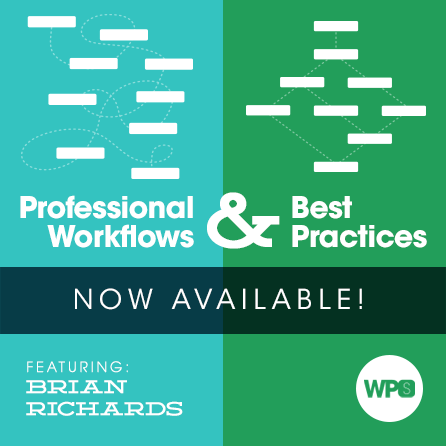 In this session we discuss professional workflows and best practices. Specifically, we walk through setting up local development environments, staging sites, working with source control using Git, and automating repetitive tasks via Grunt. This is the most requested topic for WPSessions from people of all experience levels. No matter what we know, it seems, we always want to know how others work to see if we can find improvements. This month we’re going to try something a little different. Instead of three different presenters Brian Richards will be presenting each topic. The live session will still be broken into three separate 30-40min presentations with their own separate Q&A periods. Before starting any project it is imperative to have a proper foundation. For web development, a strong local environment is our foundation. Given that, we need to be sure that our local environment is a good approximation of a site’s production environment and allows us the freedom to develop a site regardless of our connection to the outside world. We’ll start this session by comparing the various tools available to us for local environment. Then we’ll look at how easily OS X can be setup to serve WordPress sites in 5 minutes flat, followed by installing an entire, stand-alone web server locally using a tool called Vagrant. After we have a good environment running locally we’ll explore the different options you have for creating a publicly accessible staging environment and the pros & cons of each option. Remember: the ultimate goal here is to get a firm footing for easily creating robust, production-ready sites. In this presentation we’ll first talk about the tools you can install to make your command line experience far superior to anything you might expect. The goal with this is to make your terminal work for you and with you. Once we’ve got a terminal experience we love and are comfortable with we’ll install WP-CLI and take a look at a few of the ways we can control WordPress using the command line. Then we’ll dive into working with Git and all the ways it can improve your life. The main purpose of git is to provide you with a sane and safe workflow for controlling the codebase of any project. To that end, we’ll cover (briefly) a few popular and successful branching models for working on projects of all shapes and sizes and then we’ll dig in deep to how you can use git to minimize and identify bugs. We’ll also look at using Git as the gatekeeper for our deployment strategy and how we can move code from our local repository into the staging and production servers.